It’s a tall order trying to say everything you want in a story in 30 minutes and not leave it feeling forced or that the plot is too thin. 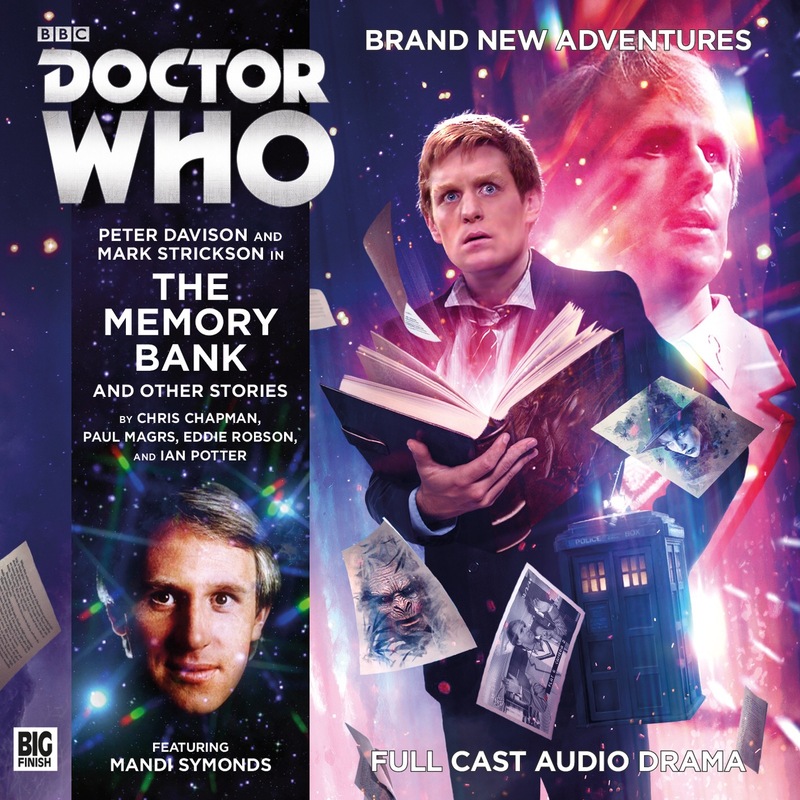 Memory Bank is a good example of getting it right and no matter what I might say in the rest of this review; I know I would struggle to tell as good a Doctor Who story in such a short time. First up we have the title story, ‘Memory Bank’. Turlough accidently takes over from a man who has to remember everyone on a planet’s memories. If anyone is missed out of the remembrance then they cease to exist. It’s a great idea for the story by Chris Chapman; the back story of how it works is questionable, but you definitely don’t mind suspending some disbelief for a story told in such a short time. The ending does feel a little rushed and you do find yourself wishing a strong idea like thisbhad a further 10 or 15 minutes to breathe. The Last Fairy Tale by Paul Magrs probably fits itself into the format the best. It’s a simple, elegant and engaging tale. The Doctor is thought to be a great magical story teller of legend in the medieval European village of Vadhoc. Turlough, assuming the Doctor really is this story teller goes along with the story; but what happens when dwarves and old hags object to how they have been portrayed in these stories? Is it so easy to dismiss people when you actually meet the real version? And what happens when they take the man they believe to be the story teller captive. I will say no more; this story is as magical as it’s premise and it seems like someone should have thought of it before, but I can’t think of anything like it. Repeat Offender is written by Eddie Robson. In the 22nd century the Doctor is arrested for murder and he soon finds out that time travel is involved and he has been here before; or will be in his future. This story relies on stepping into the story in progress and is a nice way of taking you into the heart of the action and means that they can not only make the most of the short time the story has, but it keeps you guessing as to what exactly is going on and what actually happened. The final story, and The Becoming is a ‘coming of age’ tale from Ian Potter. We are presented with a young girl known as the Path Finder who is on a mission to gather some fruit which is hard to get to; to prove herself worthy of the voice of her ancestors which she can hear. If she is successful she will become a valued member of her tribe and her voice will be added to those heard by her people. The Doctor and Turlough help her on her mission, but in doing so could they be the reason she doesn’t make it? This is a really nice story. I don’t want to give too much away about it; but I will say this. Near the end the Doctor tries to save the day. Turlough is the only one; who with his distinct moral code, could come up with the solution they chose. Quite often you could change the companion without drastically changing the outcome of the story. Here, I think this needs to be Turlough and that’s what makes it special. All in all a great set and I admire any director; in this case Helen Goldwyn, who takes on one of these 4 half-hour story releases. With 4 different stories: short as they are, you really get to bring out more sides of the Doctor and Turlough. In the case of Turlough, it’s good to see his mysterious character seen in a kinder light. I always thought he had his own moral compass; sometimes ill at ease with that of the Doctor, but here we see why that can definitely be a good thing. 9/10 Sonic screwdrivers. Pre-order CD now from Amazon.